Parenthood can be an amazing yet a demanding experience. With busy schedules, added parental duties, life can get exhausting. This is when a fantastic baby gadget like Oricom Secure 710 Digital Video Baby Monitor comes to rescue, helping your growing family’s needs. This premium Digital Video Baby Monitor can be your friendly baby watcher keeping an eye on your bub day and night, while you go about doing other routine tasks at home. Transitioning your baby into another room. Sleep reassured: you can hear your baby’s noises all night, and you can see them when required. You can have time for yourself in bed, be it reading or catching up on TV. Monitor baby activities: it brings many benefits like checking how long it takes for your baby to sleep and the ability to work freely in another room, checking on the video monitor when necessary. Sleep training your child: your child could be lying or standing in the cot, through the monitor you can watch them and assess when it’s time for you to enter the room in case you need to intervene. The monitor may also help set a sleep pattern. Safety of your child: using a monitor you can have more control over the safety of your child and prevent injury. A baby monitor assures peace of mind and the flexibility to complete other activities at home. 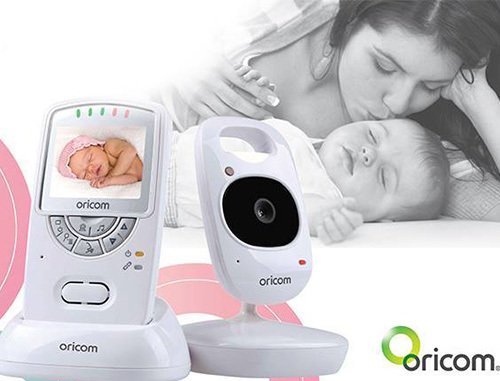 Oricom’s Secure 710 Baby Monitor offers fantastic features in the baby and parent unit. Watch your baby sleep at night: the baby unit boasts of a wall mountable infrared camera with 2x Digital Zoom, giving you clear video of the baby even when the lights are out. Comfortable nursery temperature sensor: the baby unit is equipped with a temperature sensor that displays room temperature so you don’t have to worry about your baby's room being too hot or cold. Soothing night light: the unit emits a soft light in dark which can comfort your baby. Gentle lullabies: the unit contains 5 polyphonic lullabies designed to lull babies to a blissful sleep. Keep a watchful eye through a colour display: the unit armed with a 2.4” large colour display which allows you to watch your baby anywhere at home. Talk to your child: through the parent unit you can talk back to your baby providing the comfort of your voice. Great multi-camera capability: connects to up to 4 camera units (CU710), sold separately. An excellent option for twin babies, or more kids in the same room. Portable and mobile: carry the parent unit anywhere around home. Monitor noise level in baby's room: the parent unit's sensor lights can be used to monitor noise levels, allowing you to turn down the volume on your unit. Volume control: adjust the volume level as needed. Powered by 1 Li-ion Polymer rechargeable battery pack. Includes 1 charging cradle with AC Adaptor. 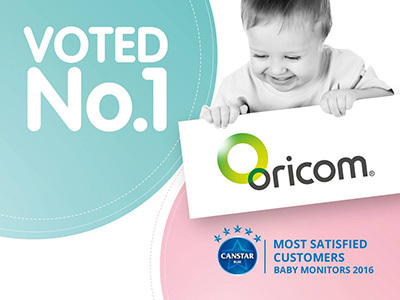 In a nationwide survey commissioned by Canstar Blue, asking feedback from Australians who bought baby monitors, Oricom was ranked the best with a 5-star rating in overall satisfaction. Battery performance Up to 8 hours of continuous operation when new battery is fully charged, with VOX turned on. Range Up to 150 meters under optimum conditions. Range is reduced in buildings through walls, doors etc. Oricom is an expert in communication technologies and a leader in ideas and design. Founded in 2003, they’re passionate about keeping people connected using the newest technologies to meet their customer’s needs at every stage of life. They produce a range of audio and visual baby monitors, breathing movement monitors, and are 100% Australian-owned. Awarded a 5 star rating by Australian research agency Canstar Blue, Oricom’s Baby Audio and Video Monitors, Breathing Monitors, Night Lights are growing popular amongst parents in Australia.